Mom has held your hand through the good times & the bad. Celebrate your love for her. This wonderful Mom pendant is beautifully crafted in silver. Buy Pendant Gifts For Mom Only On Mother Day Letters MOM Affordable Gift , sold & shipped by Fashion Jewelry For Everyone where you can shop online for Leading Online Retailer for Indian Fashion Jewelry. 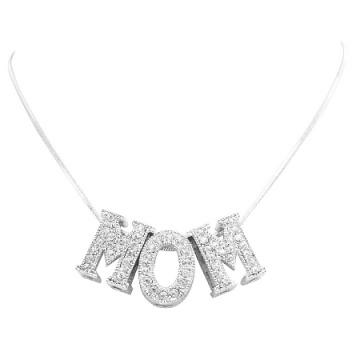 This Necklace Sets collection has been tagged as Pendant Fully,Pendant Embedded,Pendant Diamante,Mother Gift,Diamante Pendant,Diamante Fully,Diamante Embedded,Pendant,Gifts,Mom,Only,Mother,Day,Fully,Embedded,Diamante,Letters,MOM,Affordable,.